UT Southwestern now brings its world-class neurological care to the Medical Center at Richardson/Plano to serve people in northeast Dallas County and Collin County who are suffering from known or suspected neurologic illnesses. 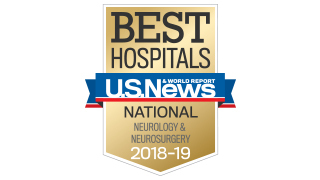 UT Southwestern’s neurosciences team includes national leaders in every neuroscience specialty, including neurology, and the program earns national ranking among nearly 5,000 medical centers in the U.S. The Richardson/Plano Neurology Clinic is an extension of this program, providing coordinated, multidisciplinary care that works for patients. When needed, our physicians can also make referrals to UT Southwestern’s Medical Center for Neurosciences and its specialized multidisciplinary programs for the treatment of conditions such as strokes or aneurysms, brain tumors, epilepsy, neuropathy and dementia. The Neurology Clinic can also refer patients for neurosurgery, neuropsychiatry, skull-base surgery, advanced imaging, and physical medicine and rehabilitation services.